hAT elements and V(D)J recombination may have evolved from a common ancestral transposable element system. Extrachromosomal, circular forms of transposable elements (referred to here as episomal forms) have been reported yet their biological significance remains unknown. V(D)J signal joints, which resemble episomal transposable elements, have been considered non-recombinogenic products of V(D)J recombination and a safe way to dispose of excised chromosomal sequences. V(D)J signal joints can, however, participate in recombination reactions and the purpose of this study was to determine if hobo and Hermes episomal elements are also recombinogenic. Up to 50% of hobo/Hermes episomes contained two intact, inverted-terminal repeats and 86% of these contained from 1-1000 bp of intercalary DNA. Episomal hobo/Hermes elements were recovered from Musca domestica (a natural host of Hermes), Drosophila melanogaster (a natural host of hobo) and transgenic Drosophila melanogaster and Aedes aegypti (with autonomous Hermes elements). Episomal Hermes elements were recovered from unfertilized eggs of M. domestica and D. melanogaster demonstrating their potential for extrachromosomal, maternal transmission. Reintegration of episomal Hermes elements was observed in vitro and in vivo and the presence of Hermes episomes resulted in lower rates of canonical Hermes transposition in vivo. Episomal hobo/Hermes elements are common products of element excision and can be maternally transmitted. Episomal forms of Hermes are capable of integration and also of influencing the transposition of canonical elements suggesting biological roles for these extrachromosomal elements in element transmission and regulation. Transposons are ancient and ubiquitous inhabitants of genomes that have played a significant role in genome evolution across kingdoms . Their activity has played a notable role in genome expansions (e.g. Zea maize, Aedes aegypti) and has contributed in a variety of ways to the generation of variation within genomes that subsequently has been subjected to natural selection during evolution . Whole-genome sequence analysis has contributed greatly to revealing how the domestication of transposons has contributed to genome expansion and complexity . These studies have shown that transposons belonging to the hAT, piggyBac, mariner-Tc1 and Harbinger superfamilies have persisted in eukaryote genomes not only as mobile DNA but as genes with new functions [3–6]. Indeed domestication of transposons is now seen, along with low frequency mobility of active transposons, as a viable strategy for the long-term persistence of these sequences in genomes. A notable example of domesticated transposable elements contributing to genome evolution is the somatic gene rearrangement system (V(D)J recombination) that leads to the generation of B- and T-cell antigen receptors in the adaptive immune system of vertebrates. V(D)J recombination is mediated by the transposase-like proteins RAG1/RAG2 and DNA recombination signal sequences (RSS) flanking different gene segments that serve the same function as the terminal inverted repeats of transposable elements . The ancestral transposable elements from which the RAG/RSS system evolved have been proposed to be either Transibs  or hAT transposons . The hypothesis that the V(D)J system has evolved from Transibs is based on structural similarities between RAG recombinases and Transibs transposases along with the fact that both systems result in 5 bp duplications following sequence integration [8, 10, 11]. The idea that the V(D)J recombination system and extant hAT transposons evolved from a common ancient recombination system is also based on structural similarities between the RAG recombinases and hAT transposases as well as mechanistic similarities between the corresponding recombination reactions. The most striking similarity is the formation of terminal hairpin structures on the DNA ends flanking the gap created following transposon and RSS excision. V(D)J recombination involves the excision of RSS-flanked sequences resulting in the fusion of the terminal RSSes and the formation of covalently closed circular DNA (signal joints). Originally it was thought that signal joints were safe, inert byproducts of recombination in which the reactive 3' hydroxyls at the ends of the excised RSS were prevented from participating in subsequent recombination and eventually degraded [11, 12]. It is now clear that this is not the inevitable fate of these episomal molecules. Signal joints have been shown to be capable of reintegrating both in vitro and in vivo and recent studies have shown that they can contribute to genome instability and result in pathologies [10, 11, 13–15]. hAT element excision as well as the excision of transposable elements belonging to other classes and families of transposons can also lead to creation of covalently closed episomes [16–30]. While such forms of transposable elements have been recognized, their significance, if any, has been unclear. Although thought by some to be potential transposition intermediates, it is clear that for the Hermes transposon and probably all hAT elements, this is not the case . Nonetheless, as recognized by Arca et al. "the widespread occurrence of extrachromosomal circles suggests that they may have a functional role in transposition, rather than being inactive byproducts". Kempken and Kück suggested that episomal forms of the hAT element Restless in the fungus Tolypocladium inflatum might facilitate horizontal transfer between nuclei in heterokaryons that form occasionally as a result of anastomoses of fungal hyphae . However, this would require that episomal forms of transposable elements be capable of undergoing transposition and reintegratioin but, unfortunately, this has been rarely tested. Yang et al. reported data suggesting that reintegration of an episomal Ds element had occurred in Arabidopsis, however this appeared to have occurred via an illegitimate recombination event and not via canonical transposase/inverted-terminal repeat-mediated transposition . The only report of an effort to empirically assess the transposition potential of an episomal eukaryote transposable element failed to find any evidence of episomal Ac/Ds reintegration in Nicotiana tabacum . While Gorbunova and Levy concluded that episomal hAT elements are merely abortive excision products, the recent findings of V(D)J signal joint recombination activity [10, 11, 13–15] and the results reported here indicate that these elements are likely to have biological significance. We describe here the biology of the episomal forms of the closely related and functionally interactive hAT elements hobo and Hermes. hobo was originally isolated from D. melanogaster  and Hermes was isolated from the housefly, Musca domestica . The amino acid sequences of the transposases of these elements are 55% identical and the terminal inverted repeat sequences are also highly similar . Because of these similarities, these elements are capable of interacting, resulting in cross-mobilization [33, 35]. We show that the creation of episomal hobo/Hermes elements occurs frequently during element excision relative to the overall element excision rate. A large proportion of the episomal forms of these elements contained all of the molecular information required for transposition. Episomal hAT elements did not only arise during element excision in experimental systems but also in natural systems in which elements are normally undergoing transposition. Episomal forms of Hermes elements were detected in somatic tissue as well as unfertilized eggs of Musca domestica and transgenic Drosophila melanogaster. The detection and recovery of episomes from the somatic tissue of M. domestica, the natural host of Hermes, indicates that this element is active in this species. The presence of episomal Hermes in unfertilized eggs indicates that they can be transmitted maternally. We describe the reintegration of various forms of episomal Hermes elements in vitro and in vivo demonstrating that, like V(D)J signal joints, these molecules are recombinogenic and possibly able to contribute to the dynamics of transposable element transmission in nature. Finally, we show that the presence of episomal Hermes elements can influence the transposition of canonical Hermes elements suggesting that episomal elements may play a role in the regulation of element movement. hobo episomes were recovered during in vivo hobo mobility assays performed in developing D. melanogaster embryos. They were obtained following the simultaneous introduction into developing D. melanogaster of 'donor' plasmids containing a hobo element carrying a kanamycin resistance gene, an origin of replication and the E. coli lacZ alpha peptide coding region and 'helper' plasmids containing the hobo transposase open reading frame under the control of a heat-inducible promoter. Following recovery from developed embryos approximately 18 hours post-injection, recovered DNA was digested with restriction endonucleases Kpn I and Xba I. hobo episomes did not contain Kpn I and Xba I restriction sites and were resistant to digestion by these restriction endonucleases while donor and helper plasmids were cleaved multiple times. Introduction of the digested DNA into E. coli permitted the recovery of only episomal forms of hobo. hobo episomes were readily recovered under these conditions and for approximately every 1000 donor plasmids recovered from injected embryos six hobo episomes were isolated ( = 0.0061, SEM = 0.0040, n = 7)). hobo excision products consisting of donor plasmids with an empty hobo integration site were also recovered during the same experiments at a rate of approximately three in every 1000 recovered donor plasmids ( = 0.0031, SEM = 0.0006, n = 5). Analysis of variance indicated that there was no significant statistical difference between the frequency of recovery of hobo episomes and empty hobo donor sites (F1,10 = 0.3831, P = 0.5497). A variety of specific forms of hobo episomes were recovered from plasmid-based mobility assays, differing in the sequence of the junction between the left and right terminal sequences (Table 1). Of the 38 episomes recovered from plasmid-injected embryos and whose sequence was determined, 15 (39%) contained intact left and right inverted terminal repeats and contained all of the information necessary for transposition. Three of these 15 'intact' episomes were perfect end-to-end joints of the left and right terminal inverted repeats. The remaining 12 'intact' episomes contained from 1 to 20 nucleotides between the inverted terminal repeats. Three of these episomes had intercalary DNA with sequences related to the inverted terminal repeats of hobo (ie. TTCTTCT, AGAACTTCTCTG, ATGCGGCTGCAGTTCTCTG). The remaining 23 (61%) 'defective' hobo episomes were missing one (19) or both (4) of the inverted terminal repeats and had variable amounts of their sub-terminal sequences deleted. These deletion-containing episomes are not expected to be transpositionally competent. a arrows represent intact ITRs and their orientation. The size of deletions is indicated by negative numbers. 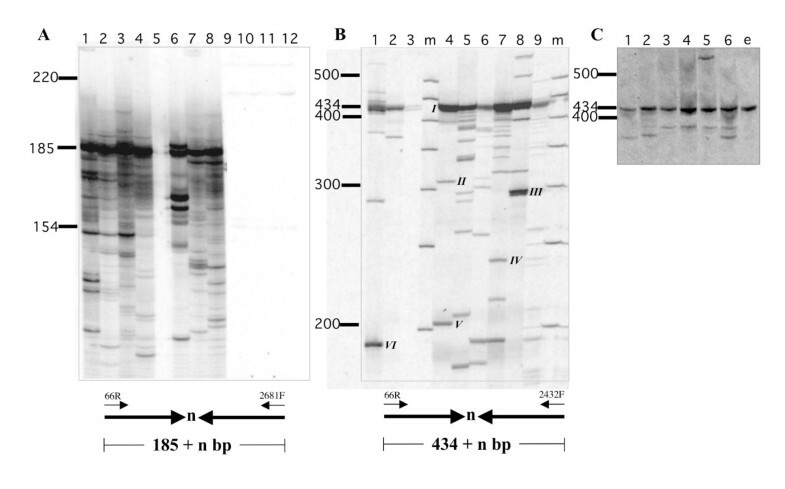 Hermes episomes were recovered from two transgenic D. melanogaster containing integrated, self-mobilizable Hermes elements (Hermes 7011 and Hermes 198H70-1) (Figure 1). Episomes in insects containing Hermes 7011 were detected using a nested PCR strategy using two pairs of Hermes terminus-specific primers oriented so that PCR products will only arise when the termini are joined end-to-end (see Methods, Figure 1). The DNA sequence was determined for a sample of the cloned products arising from this PCR reaction (Table 2). Thirty-five percent (9/26) of the episomes recovered using this method had intact inverted repeats and all of the sequence information necessary for transposition. Only two of the recovered episomes were perfect end-to-end joins. Thirty-one percent (8/26) had only intact left inverted terminal repeats with variable amounts of the right end being deleted while 19% (5/26) had a reciprocal structure with intact right inverted terminal repeats and variable amounts of the left end being deleted. Fifteen percent of the recovered episomes were missing both inverted terminal repeats and adjacent sub-terminal sequences. Structure of the autonomous Hermes elements used in this study. Hermes terminal sequences are shown as thick black arrows with associated nucleotide numbers in parenthesis. Primers used are thin arrows with their corresponding name. The position of relevant restriction endonuclease sites are shown using conventional abbreviations (BamHI, EcoRI, MspI). Hermes ORF - the complete Hermes transposase open reading frame. hsp70 5'-promoter from the hsp70 gene of D. melanogaster. hsp70 3' - 3' untranslated region of the hsp70 gene of D. melanogaster. Actin5C - promoter from the Actin5C gene of D. melanogaster. EGFP- the complete coding region for Enhanced Green Fluorescent Protein. SV40 3'- 3' untranslated region of Simian Virus 40. Ori - ColE 1 origin of replication. Kanamycin - kanamycin resistance gene. Hermes episomes were also recovered from transgenic D. melanogaster using a plasmid rescue strategy. Autonomous Hermes elements containing a kanamycin resistance gene and an origin of replication permitted Hermes episomes to function as replicons in E. coli. Sixty Hermes episomes were recovered from adults and larvae of four independent 'lines' of transgenic D. melanogaster (Table 3). Approximately 50% (29/60) contained 'intact' Hermes elements with complete inverted terminal repeats. Only three (5%) were perfect end-to-end joins of the inverted terminal repeats while the remaining 26 contained variable amounts of intervening nucleotide information ranging from 1 bp to 1 kb. All other episomes contained 'defective' Hermes elements lacking either one or both inverted terminal repeats with variable amounts of sub-terminal sequences deleted; 20% had intact left inverted terminal repeats and 25% had intact right inverted terminal repeats. Hermes episomes were also detected in unfertilized D. melanogaster eggs by PCR (Table 3). The structure of episomes found in unfertilized eggs was generally similar to those found in other life stages although episomes with only the right inverted repeat (53%) were recovered more frequently in unfertilized eggs than from adults and larvae (25%). Approximately half (8) of the episomes contained complete elements including perfect end-to-end joints and those with a small number of nucleotides between the inverted terminal repeats. b number recovered from adults of lines A,B,C,D, larvae (l, all lines) and unfertilized eggs (e). Hermes episomes were also detected by PCR and recovered by plasmid rescue from transgenic Aedes aegypti containing the same autonomous Hermes element as was in the transgenic D. melanogaster described above (Hermes 7011). Episomes were recovered from developing embryos, larvae and from adult ovarial tissue and resembled those recovered from D. melanogaster in their sequence (Table 4). Structure of Hermes episomes from transgenic Ae. aegypti. a arrows represent intact ITRs and their orientation. The sizes of deletions are indicated by a negative number. d o, ovaries; l, larvae; em, embryos. Hermes is a natural inhabitant of the genome of M. domestica and has been detected in all individuals (n = 65) sampled from 13 populations from four continents . Because the Hermes element in these populations did not naturally contain a functional origin of replication, episomes could not be recovered by plasmid rescue and could only be detected using a PCR-based method that relied on the use of PCR primers specific to the right and left terminal sequences of the element that would result in PCR products only when the termini were joined end to end. Total genomic DNA isolated from individual M. domestica from three populations had evidence of episomal Hermes elements as indicated by the recovery of PCR products using end-specific primers (Figure 2B). The most abundant forms were perfect (434 bp) or near perfect (> 434 bp) end-to-end joints containing all of the information necessary for transposition (Figure 2B; Table 5). As in transgenic D. melanogaster, 'defective' forms were also recovered with variable amounts of terminal sequences deleted from PCR products less than 434 bp (Figure 2B). All 'defective' forms recovered were missing the right inverted terminal repeat and, in one case, both termini were absent (Table 5). Finally, episomal Hermes elements were detected in unfertilized eggs of M. domestica (Figure 2C). Episomal detection using PCR. A. PCR reaction products from 8 individual transgenic adult D. melanogaster (Canton S) with the autonomous element Hermes 7011 (lanes 1-8). Lanes 9-12 contain the products of identical PCR reactions using the equal amounts of genomic DNA from non-transgenic Canton S individuals. The diagram below schematically illustrates the structure and size of PCR products arising from Hermes elements with their terminal inverted repeats (thick arrows) joined as shown using the primers indicated (66R, 2681F) with variable (n) numbers of nucleotides of intercalary DNA. The positions and size in basepairs of molecular weight standards are indicated. B. PCR reaction products from 9 individual M. domestica adults from 3 geographically distinct natural populations. The diagram below schematically illustrates the structure and size of PCR products arising from Hermes elements with their terminal inverted repeats (thick arrows) joined as shown using the primers indicated (66R, 2431F) with variable (n) numbers of nucleotides of intercalary DNA. Molecular weight markers (m) and their sizes in basepairs are shown. Roman numerals refer to bands that were excised, reamplified, cloned and sequenced. The results are shown in Table 5. C. PCR reaction products from 6 individual M. domestica adults from the laboratory colony, Cs. DNA from unfertilized eggs (e) from this colony was also used as template in these PCR reactions. The positions and size in basepairs of molecular weight standards are indicated. Structure of Hermes episomes from M. domestica. a arrows represent intact ITRs and their orientation. The size of deletions is indicated by negative numbers. Roman numbers refer to bands in Figure 2B. The recombination potential of a variety of Hermes episomes was tested directly using a cell free Hermes transposition assay with purified Hermes transposase, episomal Hermes elements and a target plasmid. Hermes episomes with n nucleotides of intercalary DNA between the inverted repeats were tested where n was 0, 1, 4, 5, 17, 37,69 and 120 nucleotides. All episomal forms of Hermes tested were capable of transposition resulting in canonical 8 bp target site duplications with the sequence nTnnnnAn (Table 6 and Figure 3). The distribution of integration events within the target indicated that certain sites were preferred as we have previously described (Figure 3) although the apparent hot spots of integration in vitro are not the same as reported in vivo (Table 6) [37, 38]. Integrations at nucleotide 94 of the target plasmid were recovered frequently however it is not known whether the primary nucleotide sequence of this target site (ATTGAGAT) is the major determinant of this site's preferred status. Integration of Hermes episomes into target DNA in vitro. 1"Site" of integration; nucleotide number of the first base of the target sequence. 5 number of nucleotides separating the left and right ITRs of Hermes. Map of episomal Hermes integration sites in the target plasmid pGDV1. The x axis refers to the linear form of the target plasmid and the position of the chloramphenicol resistance gene (CamR) is shown. The numbers on the x-axis refer to the length of the plasmid in basepairs. The y-axis is the number of integrations. Positive and negative values refer to elements that integrated into the target in opposite orientations. Five different classes of Hermes episomes were tested for their ability to integrate with each differing only in the amount of intercalary DNA (n) located between the inverted terminal repeats. The unweighted consensus sequence of the Hermes target site is graphically represented with a sequence logo  constructed with WebLogo . Efforts to create transgenic D. melanogaster using Hermes gene vectors constructed from episomal forms of the element ('episomal Hermes gene vectors') resulted in the successful creation of transgenic insects in some cases. Germ-line transformation experiments were performed using well-established protocols (see Methods) involving the co-injection of vector and transposase-expressing helper plasmids into preblastoderm embryos followed by screening for expression of the dominant visible genetic marker present on the vector in the next generation. Episomal Hermes gene vectors containing 0, 17 and 37 bp of intercalary DNA separating the inverted terminal repeats did not result in the recovery of germ-line transformation events (n = 303; Table 7). On the other hand, identical episomal Hermes gene vectors with 80 bp and 160 bp of intercalary DNA separating the inverted terminal repeats did result in germ-line transformation in 22% (n = 23) and 28% (n = 54) of the germ-lines tested (Table 7). Integrated Hermes elements from these transgenic insects were analyzed and in all cases (n = 16) the Hermes element was found precisely inserted into D. melanogaster genomic DNA (Table 8). The 8 bp immediately flanking the left inverted terminal inverted repeat of the integrated Hermes elements conformed to the known target site consensus sequence of this element (Table 8) [37, 38]. While we were unable to detect integration of episomal Hermes gene vectors with 0 bp or 17 bp of intercalary DNA, we discovered that these forms of the element actually inhibited transposition of canonical Hermes elements, i.e. elements with typical spacing of the inverted terminal repeats. Germ-line transformation experiments involving the co-injection of episomal Hermes gene vectors with 0 bp or 17 bp of intercalary DNA and canonical Hermes gene vectors (HermesActin5CEGFP or Hermes3 × P3EGFP which both contain over 2 kb of intercalary DNA and are effective gene vectors) failed to produce any transgenic insects (n = 306). Identical experiments using only the canonical Hermes gene vectors confirmed their functionality and transformation was observed at a frequency of approximately 10% (n = 49; Table 7). a input vector was used for transformation; numbers refer elements from transgenic lines. b 8 bp immediately flanking the left inverted terminal repeat of Hermes. Episomal forms of eukaryote transposable elements are somewhat of a conundrum in that they are characteristically associated with many transposable element systems but are of unknown biological significance [16–30]. Reports of V(D)J signal joints being recombinogenic and capable of reintegrating into the genome of the host suggest that perhaps episomal forms of transposable elements were also capable of reintegration [10, 11, 13–15]. Hermes and hobo episomes were detected and recovered in this study under a variety of conditions using both bacterial replicon recovery methods (plasmid-rescue) and PCR-based methods. PCR detection of episomal elements depended upon the juxtaposition of the left and right inverted terminal repeats. Integrated hAT elements arranged in tandem could also yield PCR products with a structure and sequence similar to episomes. It is unlikely, however, that such elements were responsible for the PCR products recovered in this study because of the diversity of products recovered. Two elements arranged in tandem are expected to yield an invariant PCR amplification product but such was not the case in this study where episomal forms of the elements were recovered that had varying numbers of nucleotides between the inverted terminal repeats. In M. domestica and transgenic D. melanogaster, 27 and 21 distinct episomal forms of Hermes were detected by PCR, respectively. The copy number of Hermes in each of these species was estimated to be less than ten making it unlikely that chromosomal elements arrayed in tandem were the templates yielding the PCR products recovered in this study . Finally, plasmid rescue experiments that did not involve PCR resulted in the recovery of Hermes episomes with structures identical to those recovered by PCR analysis. Therefore, we found no evidence to support a conclusion other than that the DNA molecules described here were episomes of hobo and Hermes. Hermes and hobo episomes appear to be abundant products of hAT element excision/transposition reactions under some conditions. hAT elements transpose by a cut-and-paste type mechanism that is initiated by excision of the element from a donor site . The excised element and associated transposase form a synaptic complex that associates with a target molecule and integrates . In interplasmid hobo mobility assays performed in insect embryos, element excision products (empty donor sites) and episomal forms of the element were recovered from the same reactions at frequencies that were not significantly different. Under the conditions used here episome formation occurred readily during hobo movement. While episomal forms of hAT elements are prevalent, their structures are very diverse. Very few of the episomal forms of Hermes and hobo were precise end-to-end joints of the inverted terminal repeats although 40%-50% of the episomes recovered in this study contained both copies of the element's terminal sequences. The intercalary DNA between the element's inverted terminal repeats varied in both quantity and sequence with no single form being dominant. While the origin of intercalary DNA in most cases was unknown, in three of the hobo episomes recovered the intercalary DNA appeared clearly related to the inverted terminal repeat sequences of hobo (Table 1). These sequences appear to have arisen following the resolution of terminal hairpin structures prior to the formation of the episome. This is unexpected because hairpin structures are not usually formed at the termini of excised hAT elements but on the ends of the donor sequences instead . These unexpected and unusual intercalary sequences associated with hobo episomes are not explained by our current models of hAT element transposition . The most significant finding of this study is that episomal hAT elements can reintegrate into target DNA molecules resulting in canonical integration events both in vitro and in vivo. Hermes episomes with 0 - 17 bp of intercalary DNA between the terminal inverted repeats could integrate into DNA target molecules in vitro. In these studies precise quantitation of integration activity was not performed however recovery of the events analyzed in this study required extensive screening of target molecules recovered from multiple in vitro transposition reactions. In vivo, the integration of Hermes episomes with 0-37 bp of intercalary DNA separating the terminal inverted repeats was undetectable under the conditions used in these experiments and screening the progeny of a combined 303 fertile G0s. When the amount of intercalary DNA separating the terminal inverted repeats was 80 bp or greater the frequency of integration, in vivo, was comparable to canonical Hermes gene vectors. These data demonstrate that some forms of episomal Hermes elements can efficiently reintegrate. The in vitro integration results with episomal Hermes elements are similar to those reported by Neiditch et al. who reported that RAG recombinase could cleave and transpose signal joints in vitro leading to the integration of signal joint episomes . Overall these data further support the idea that V(D)J recombination and hAT elements may have evolved from a common ancestral transposable element. Signal joints are no longer considered inert segments of DNA resulting from V(D)J recombination but are recognized as potential contributors to genome instability and disease in vertebrates . Episomal forms of hAT may also contribute to a number of important aspects of the biology and natural history of these elements. hAT elements, like many other Class II transposable elements, have periodically undergone horizontal transfer. While the exact mechanisms by which DNA is exchanged between species remain unknown, episomal forms of excised elements may provide a stable but integration-competent form of the element that can be more readily transferred between organisms. Interestingly, Hermes episomes were readily recovered from adult houseflies, a natural host of Hermes, indicating for the first time that these elements are actively transposing in this species and that they are likely to be active in somatic tissue. These conditions seem to be favorable for interspecies transfer and the data reported here show that some of these episomal forms of Hermes can undergo transposition. The presence of hAT episomes in unfertilized eggs suggests that these elements may also be maternally transmitted, a mechanism of transmission that has never been described for Class II transposable elements. This novel transmission mechanism might influence the transmission and population dynamics of these elements under certain conditions. Finally, in addition to episomal hAT elements being transpositionally competent they also appeared to influence canonical element movement. The presence of episomal Hermes elements with 0 or 17 bp of intercalary DNA separating the terminal inverted repeats resulted in the reduced recovery of canonical Hermes transposition events in vivo. It is not clear at this time whether the effect is caused by repression or interference or some other mechanism. In germ-line transformation experiments involving the co-injection of canonical and episomal forms of Hermes elements the overall concentration of Hermes elements was comparable to that used in many insect transformation studies, suggesting that a simple titration effect was not responsible [42–44]. If, however, Hermes transposase binding to episomal forms of Hermes elements is different from binding to canonical forms then perhaps transposase titration is a possible mechanism. More experimentation is required to explore these interesting possibilities. Nonetheless, these data point to another possible biological role of episomal hAT elements, namely the regulation of element transposition. Episomal forms of the hAT elements hobo and Hermes are readily recovered under a variety of conditions. The recovery of episomal forms of Hermes from M. domestica, transgenic D. melanogaster and A. aegypti demonstrates the somatic activity of this element in these species. Episomal forms of Hermes are capable of participating in transposition/integration reactions in vitro and in vivo. They can also be transmitted maternally and under some conditions reduce the amount of canonical Hermes element transposition. These studies begin to reveal the potential biological significance of these widespread forms of extrachromosomal DNA. Adults were collected from natural populations (kindly provided by Dr. Elliott Krasfur, Iowa State University) and from laboratory colonies (the laboratory strain Cs was kindly provided by Dr. Jeffery Scott, Cornel University). Using previously reported methods, transgenic lines were created using the Hermes gene vector 198H70-1 and the host strain w1118 (Figure 1) . The vector 198H70-1 contained, in addition to approximately 500 bp and 700 bp of the right and left ends of the Hermes transposable element, respectively , the transposase open reading frame under the regulatory control of the D. melanogaster heat shock 70 (hsp70) promoter and the Enhanced Green Fluorescent Protein (EGFP) open reading frame under the regulatory control of the D. melanogaster Actin 5C promoter , a kanamycin resistance gene, a ColE 1 origin of replication and the E. coli lac Z alpha peptide coding region . Because these transgenic insects contained an autonomous (self-mobilizing) Hermes element, stable lines could not be established and maintained. Therefore transgenic populations were maintained by selecting EGFP-expressing individuals every other generation to ensure the transgene was at a high frequency within the laboratory population. The presence of an antibiotic resistance marker and a prokaryotic origin of replication enabled this vector to be used in plasmid rescue experiments from transgenic individuals. Transgenic D. melanogaster (w11118) were also constructed using the Hermes gene vector 7011 . This vector was identical to 198H70-1 except it lacked the kanamycin resistance gene, the origin of replication and the lacZ alpha peptide-coding region (Figure 1). Because this vector also was a self-mobilizing (autonomous) Hermes element stable lines could not be established and this line was also maintained by periodic selection of EGFP-expressing individuals, as described above. D. melanogaster (w11118) were used as hosts to perform Hermes and hobo plasmid-based mobility assays in developing embryos. Using reported methods the Orlando line (a wild-type laboratory strain) was transformed with the Hermes vector 198H70-1 . Because of the low level of germ-line remobilization activity of Hermes in this species, maintenance did not require periodic selection for individuals expressing EGFP as was necessary for transgenic D. melanogaster containing the same vector . Genomic DNA was extracted from adult insects as described (using protocol 48 in "Drosophila: A laboratory manual", ) or using Wizard Genomic DNA Purification Kits (Promega, Madison Wisconsin) according to the manufacturers recommendations. Low molecular weight DNA (plasmids or episomes) was isolated according to the method of Hirt . One to five μg of undigested D. melanogaster genomic DNA was used in the electroporation of DH10-β E. coli (Invitrogen, Carlsbad, California) and the treated cells were grown in 1 ml of SOC  at 37°C for 1 hour. Cells were then concentrated by centrifugation, suspended in approximately 100 μl of SOC and spread on LB plates containing 25 μg/ml of kanamycin. Resistant colonies were isolated and plasmid DNA extracted and digested with restriction endonucleases EcoR I and BamH I. Hermes episomes originating from 198H70-1 excision are predicted to yield Bam H1 and Eco R1 fragments approximately 2.7, 2.6, 1.3, 0.6 and 0.4 kb in length depending on the exact structure of the joined ends of the element. Final confirmation of the structure of the recovered episomes was made by DNA sequencing using primers HL216 (5' GCA GGC GAC TGA GTA ACA ACA AT AAC AAC 3') and HR2500 (5' CAA TGA GTA TAC AAC ACA ACA AAG AAG TGA G 3'). Using approximately 1 μg of D. melanogaster or Ae. aegypti (each transgenic with Hermes vector 198H70-1) genomic DNA as a template, PCR was performed in 1× Taq polymerase buffer containing 2.5 mM MgCl2, 0.8 mM dNTPs and 8 pmoles each of primers HL216 and HR2500. Following an initial step of 95°C for 3 min. 25 iterations of the following cycle were performed: 95°C/15 sec, 55°C/15 sec, 72°C/30 sec. To complete the reaction and insure that all products were fully double-stranded the mixture was incubated at 72°C for 5 min. Episomal Hermes elements are expected to yield a 470 bp reaction product if the left and right inverted terminal repeats were precisely joined end to end. PCR amplification products were purified using QIAquick PCR Purification Kit (Qiagen, Valencia, CA) and ligated to the plasmid pGEM-T Easy (Promega). Electroporation was used to introduce some of the plasmids into DH10-β by and the DNA sequences of the plasmid inserts was determined from the recovered clones. This semi-nested-primer method was used to detect and analyze Hermes episomes in wild-type M. domestica and D. melanogaster (transgenic with Hermes vector 7011). The first reaction was performed in a volume of 50 μl with 1 mM dNTP's, 2.5 mM MgCl2 with primers Hermes2432F (5' AAT ATA CTT ATG CTC TTT TCC 3') (for M. domestica) or Hermes2681F (AAA ATA CTT GCA CTC AAA AGG C 3') (for D. melanogaster) and Hermes333R (5' TCG GAA CAT TTT GCT GTG 3'), each at 0.6 μM and 5% of the genomic DNA from individual insects as template. The reaction conditions involved a preliminary denaturation step of 95°C for 3 minutes followed by 25 cycles of 95°C/15 sec, 56°C/1 min, 72°C/1 min. Following these 25 cycles the reactions were incubated 72°C for 5 minutes. The reaction conditions for the second reaction were identical to those of the initial reaction but primers Hermes2432F (for M. domestica) or Hermes2681F (for D. melanogaster) and Cy5-66R+ (5' Cy5-AAT GAA TTT TTT GTT CAA GTG GCA AAG CAC 3') were used with 5 μl of a 20× dilution of the initial reaction as template. Following the reaction, approximately 5 μl was size-fractionated using a high resolution electrophoresis system consisting of a 1 mm thick 6% polyacrylamide in Tris Borate buffer and 8 M urea. The resulting gel was dried onto filter paper and scanned using the 633 nM light source of a Storm 860 gel/blot imaging system (Molecular Dynamics, Piscataway, NJ) to directly visualize the Cy5-labelled PCR products. Transposable element display permits all members of a transposable element family in the genomic DNA of individual insects to be detected and visualized as unique PCR products. Hermes transposable element display was performed here as described . Pre-blastoderm D. melanogaster embryos (w1118) were injected with a mixture of the plasmids pHobo8bpdrKanOriLacZ and pHspHobo (each plasmid was at a concentration of 250 μg/ml) as described . Injected embryos were incubated at 25°C overnight and approximately 18 hrs post injection the embryos were placed at 37°C for 1 hr and allowed to recover for 1 hr at 25°C. After heat shock and recovery viable embryos were collected and low molecular weight DNA was recovered as described . To recover episomes low molecular weight DNA was digested with restriction endonucleases Kpn I and Xba I and used to electroporate E. coli (DH 10β). Kpn I and Xba I cut pHobo8bpdrKanOriLacZ within the donor plasmid backbone but not within the hobo element. Any excised episomal forms of hobo present within the sample will be resistant to digestion and will transform E. coli to kanamycin resistance with β-galactosidase activity. Plasmids from E. coli transformants were confirmed as hobo episomes by digesting with the restriction endonuclease Sal I and finally by determining the sequence of DNA spanning the inverted terminal repeats. To recover hobo excision events (empty donor sites) recovered plasmids were introduced directly into E. coli and selected for chloramphenicol resistance. Chloramphenicol resistant colonies that were negative for β-galactosidase activity and sensitive to kanamycin were confirmed as excision products by digestion with restriction endonuclease digestion with Kpn I and Xba I. In vivo inter-plasmid transpositions assays have been used extensively to investigate insect hAT elements (e.g. Sarkar et al. ). Here the assay has been adapted to a cell-free system and consists of a donor element (episomal forms of Hermes), a target plasmid (pGDV1) and purified Hermes transposase . The episomal forms of Hermes tested in this assay contained a kanamycin resistance gene, a ColE1 origin of replication and the E. coli lacZ alpha-peptide coding region . The target plasmid, pGDV1, is a gram-positive chloramphenicol resistant plasmid that cannot replicate in E. coli without the addition of a species-compatible origin of replication [38, 54]. Reactions were performed in 20 μl of 20 mM HEPES pH7.9, 25% glycerol, 5 mM MgCl2, 4 μg bovine serum albumin, 2 mM DTT with 250 ng each of donor and target plasmids, ands 1 μg of purified Hermes transposase . The reaction was incubated at 30°C for 1-2 hrs at which time 80 μl of stop solution (50 mM Tris pH 7.5, 0.5 mg/ml proteinase K, 10 mM EDTA and 0.1 μg/ml tRNA) was added and incubated at 37°C for 1 hour. The reaction was extracted with phenol/chloroform and the DNA was precipitated with sodium acetate and ethanol and the dried precipitate was dissolved in 20 μl of water. Fifteen microliters were introduced into 80 μl of E. coli (DH10-β) by electroporation. Following electroporation 900 μl of SOC was added and the cells were incubated at 37°C for 1 hour at which time 1 μl was plated on LB plates containing ampicilin (50 μg/ml) and X-gal (20 μg/ml) to assess plasmid recovery. The rest of the cells were divided and plated on 10 LB plates containing chloramphenicol (10 μg/ml), kanamycin (25 μg/ml) and X-gal (20 μg/ml) to select for donor transpositions into the target plasmid. Restriction mapping and DNA sequencing of putative transposition events confirmed the presence and of transposed Hermes elements. Germ-line integration was used to assess the mobility properties of episomal forms of Hermes in vivo. A 1 kb fragment containing the coding region of the DsRed protein under the regulatory control of the 3× P3 promoter was inserted between the terminal sequences of episomal forms of Hermes that contained a kanamycin resistance gene, a plasmid origin of replication and the LacZ alpha peptide coding region. Hermes transformation vectors were created with episomal forms containing 0, 17, 34, 80 and 160 bp of intercalary DNA separating the terminal inverted repeats of the element. The Hermes gene vectors HermesActin5CEGFP and Hermes3 × P3EGFP were used as controls [45, 55]. Hermes transposase was supplied by co-injecting the plasmid pHSHH1.9 along with the vector containing plasmids being tested using methods previously described . RA Subramanian is currently at SUNY Downstate Medical Center; Department of Emergency Medicine; 450 Clarkson Avenue; Brooklyn, NY 11203, USA. CD Hoddle (nee Stosic) is currently at the Department of Entomology, University of California, Riverside, CA 92521, USA. This work was supported by grants GM48102 (DAOB) and AI45741 (PWA) from the National Institutes of Health. DAO'B performed the experiments involving hobo, the analysis of episomes in M. domestica, in vivo analysis of episomal Hermes element transposition in D. melanogaster. He compiled the data and wrote the manuscript. CDS performed the analysis of Hermes episomes in transgenic D. melanogaster. KP performed the in vitro analysis of episomal Hermes elements. RAS performed the in vitro analysis of episomal Hermes elements and assisted in data analysis. RHH developed the in vitro transposition assays for Hermes elements. PWA supervised CDS and RHH, developed the in vitro transposition assays for Hermes elements, performed the analysis of Hermes episomes in transgenic D. melanogaster, analyzed data and wrote the manuscript. All authors have read and approved the final manuscript.